Most women will have a head of hair that is 50% grey by the time that they reach the age of 50. 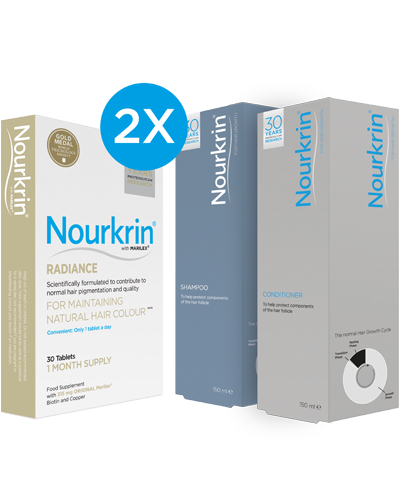 Nourkrin® Radiance is for all women, who wish to maintain normal hair pigmentation and colour for longer. Have used before about three years ago and they really work (used for 6 months) maybe I should have kept up. Ordered again as I was pleased with results last time. 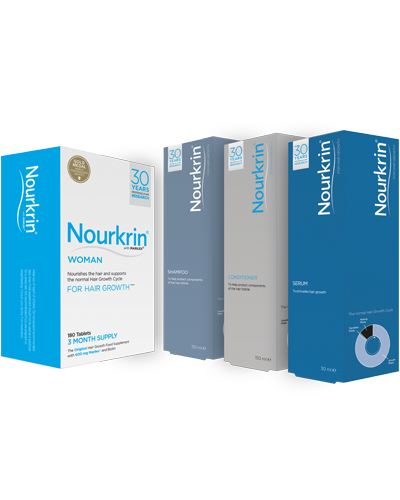 Once the first signs of hair greying are observed, it is advisable Nourkrin® Radiance is started and continued as a maintenance programme until the hair greying rate is significantly reduced and under control. This ensures that the hair greying is kept to a minimum and prevents premature ageing of the hair follicles. This means that you can proactively provide the support required for your hair to maintain normal colour and optimal appearance – helping to delay the onset of changes in hair colour. Nourkrin® Radiance is completely safe and 100% drug-free. Marilex® (fractionated fish extract with specific lectican proteoglycans), cupric gluconate, D-biotin, bulking agents (microcrystalline cellulose; calcium hydrogen phosphate), stabilisers (hydroxypropylmethyl cellulose; magnesium salts of fatty acids), glazing agents (talc; glycerol), colours (titanium dioxide). Subscribe to our newsletter to stay up to date on the newest research within the field of hair growth disorders and female hair loss, information about upcoming events and competitions with Nourkrin® Radiance.